The Type-R Thin subwoofer series combines the intense low-bass performance and ground-shaking output of the traditional Type-R subwoofers in a thin package optimized for extremely small enclosures. The Type-R Thin series have been engineered to offer more installation flexibility and application versatility to build the ideal sound system. At 82 mm deep for the 10” and 89 mm deep for the 12”, these subs provide deep bass performance where it normally couldn’t fit. And the 9.9 l (SWR-T10) and 17 l (SWR-T12) ideal enclosure sizes mean great bass performance can go just about anywhere in your vehicle. The new Type-R Thin boasts no less than 7 unique Alpine technologies in its industry-first design. These innovations allow the Type-R Thin to have the output and power handling of the traditional Type-R series in less than half the depth. The new Type-R Thin design has the same DNA of the standard Type-Rs - demanding cleaner, deeper bass extension, faster, more accurate transients and even greater output capability. You can count on Type-R Thins to deliver strong, impactful output like its predecessors. 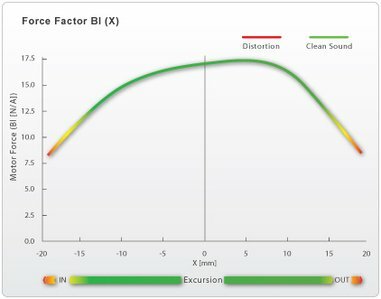 Most shallow-mount subwoofers have less output than traditional deep subwoofers, since their shallow frame limits how far their cones can move at high power levels. The Type-R Thin uses Alpine’s patent pending Pass-Through Gap Geometry, allowing the unique Thermoplastic Elastomer Segmented Spider to completely pass through the motor structure. This means the cone and voice coil assembly have the clearance needed for over 50mm of peak-to-peak excursion, allowing for massive output even in such a shallow frame. There’s no need to play your sub for hours to break it in to achieve consistent performance. This sub is designed to deliver consistent performance right out of the box. Since this revolutionary design is made with an injection mold resin, rather than phenolic stiffened textile, this new spider requires no break in to achieve ideal performance. A Co-Molded Aluminum collar attaches the voice coil to the spider to ensure a reliable, high-strength design. 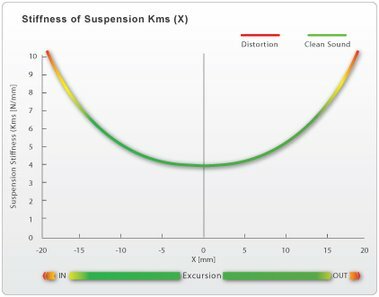 These two graphs are from the industry standard measuring system, Klippel which illustrates the excursion of the subwoofer both relative to the strength of the magnet system, and the stiffness and linearity of the suspension. Alpine’s Patented Dual-Sided Compound Radius Curve pole geometry ensures an ultra symmetrical magnetic field with optimized flux density to greatly reduce distortion, while further improving power handling and output. (U.S. Patent #6,639,993). The new FEA-Optimized Motor Structure together with the revolutionary High-Amplitude Multi- Roll (HAMR) Suspension Design gives the new Type-R Thin Subwoofers the highest X-max and SPL output in the category. With a real-world, measured 15mm of X-max, allow the new Type-R Thin Subwoofers to deliver the best-in-class bass output, ultra-low distortion, and unparalleled sound quality. Match the right amount of power for one or two Type-R thins? Type-R Thin’s 1.5lb neodymium magnet has 5x the magnetic strength than standard ferrite magnets used for most subwoofers. This powerful magnet combined with a massive 4” (100mm) voice coil delivers increased power handling and more accurate, louder, cleaner bass with even more control. Heavy-duty magnet assembly calls for heavy-duty cone materials. A specially engineered cone is reinforced by an injection-molded force transfer assembly, giving the cone structure outstanding stiffness while minimizing moving mass . A centering ring in the force transfer assembly is also engineered to lock the voice coil assembly in place. This makes the entire piston assembly extremely strong and linear. Alpine’s Patented Radial Vented VC Heat Sink and Airflow Management System (US Patent #7,634,101) helps to minimize power compression and ensures reliable long playing time by actively pulling (or transferring) output-robbing heat away from the Voice Coil The new cast aluminum frame is directly coupled to the machined aluminum shorting sleeve assembly. This allows the entire frame to act as a heat sink for sustained power handling, even in the most extreme of applications. Actively manages voice coil temperatures by forcing air directly across the heat sink system. Creates a symmetrical magnetic field with evenly distributed flux density to greatly reduce distortion, while further improving power handling and output. Provides the mechanical clearance needed for over 50mm of peak-to-peak excursion, unleashing massive output potential from a small package. The High-Amplitude Multi Roll Surround Design allows for extreme excursions without sacrificing valuable cone area. FEA Optimized for linearity and made with injection-molded Santoprene ®, the HAMR surround is a key part of the suspension system that provides accurate, distortion-free control at extreme excursions. If you are unsure about the suitability of this product please contact us via the ask a question link at the top of this page or telephone us and we will gladly assist you. Alpine SWR-10D2 Introducing A New Level of Type-R Performance These redesigned fifth-gene..
Alpine SWR-10D4 Introducing A New Level of Type-R Performance These redesigned fifth-gene..
Alpine SWR-12D2 Introducing A New Level of Type-R Performance These redesigned fifth-gene..
Alpine SWR-12D4 Introducing A New Level of Type-R Performance These redesigned fifth-gene..
Alpine SWR-T12 A New Generation of the Unrivaled Type-R The Type-R Thin subwoofer series ..